FOSJOAS intelligent self-balancing scooters are like urban savior. The artistic shape and superior performance has given FOSJOAS self-balancing scooter a role in the transportation field. A new trip mode is born to initiate a revolution. 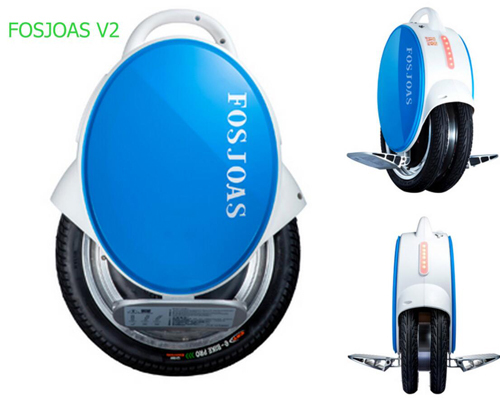 FOSJOAS electric self-balancing scooter V2 is released in the latter half of the year 2015. After making an official debut in the market, it is quite welcomed by many people. Visually, it inherits the contracted design of FOSJOAS's technology. Unique contoured shape combined with textured material adds value to the product. It is specially introduced with two silica gel pads on each side of the scooter body to give a comfortable feeling for two legs. FOSJOAS loyal users could easily recognise the difference in foot pedals between V2 and previous electric unicycles. The special orthodrome shape design of the pedals will protect riders' feet from potential injury. Riders stand on the large pedals will feel more stable and comfortable. Judging from the appearance, there is not too much difference. But it is refined in some details. The most noticeable breakthrough is the elevation in riding comfort level. Similar to other FOSJOAS products, it has four protective functions such as speed limit and low battery warning. To guarantee a safe riding, the maximum speed of V2 could not surpass 18 km/h and the longest running distance after a full charge is less than 20 km. For daily commuters, V2 could already meet the demand for daily commuting. Apart from the fancy shape design, V2 has many practical functions. A foot brake is introduced. FOSJOAS shows its originality in its products. Designers, when devising the twin-wheeled self-balancing unicycle has laid much emphasis on user experience. The originality of V2 is that it could satisfy the tastes of various kinds of people. For trendsetters who chase after fashion and changes, they could find the vogue elements in V2. For young urban white collars, they could find the convenience of riding and parking V2.